1. Start by spraying olive oil in a hot skillet on medium heat. Cook the squash, peppers, and onions until 90% softened, about 10 minutes. 2. Add spices, salt, and garlic and cook another 3 minutes. 4. Top with vegan cheese shreds and cover. Remove from heat and allow the steam to melt the cheese. Serves 4-6 persons. 1. In a glass baking dish, layer 3-4 corn tortillas. Depending on the shape of your dish, you may need to cut some tortillas in half to cover the corners. 2. Lightly spray olive oil with each layer of tortillas and then sprinkle garlic and onion powder on top. 3. Next, pour and cover red chili over corn tortillas until completely covered. 4. Then layer some of the black beans and rice and some sliced mushrooms. 5. Now layer some mixed baby greens, cilantro, and red onion. 6. Top with Daiya cheese and then some more red chili. 7. Repeat steps 2-5 for about 3-4 layers or depending on how much your making. 8. After your done layering, top with 3 or 4 corn tortillas and pour remaining red chili on top. 9. Cover and bake at 375 degrees for about 20-25 minutes. How about adding more raw power to your dinner tonight? If you’ve never tried “raw tortillas”, well now you can! 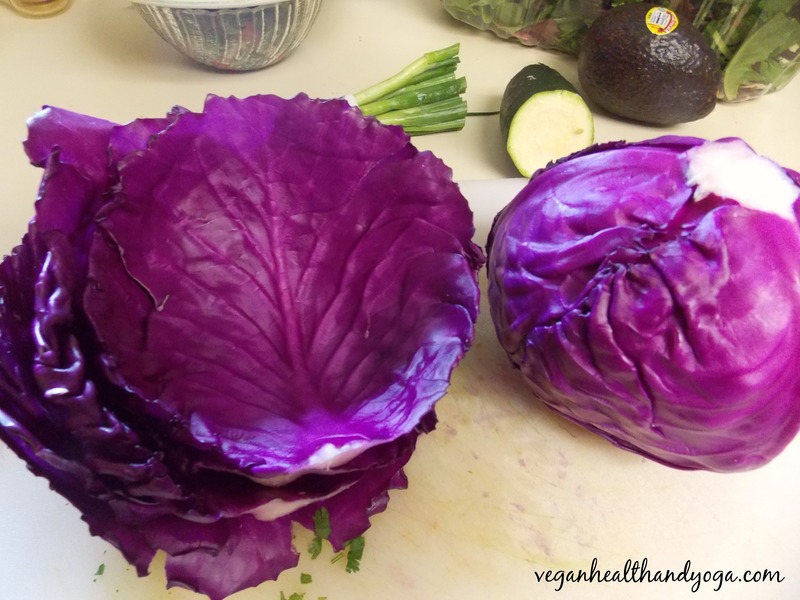 Swapping out wheat or corn tortillas for red cabbage leaves can save you lots of calories which can be very helpful when your trying to lose weight. On average, wheat tortillas contain anywhere between 100 to 150 calories each with a few grams of fat. Corn tortillas give you about 50 calories each. One cabbage leaf has only about 4 calories! They also provide more vitamin C and add more disease fighting nutrients. Another bonus of using cabbage instead of tortillas is increasing your intake of raw fiber which helps to slow you down and eat less. You can fill up your “tacos” with a lot more ingredients too without breaking them through. If your trying to get more raw foods in your diet but don’t want to go fully raw, incorporating little changes like these can be the solution. So get raw inspired with these purple fajita quinoa tacos! Just one head of cabbage can provide plenty of “tortillas” to feed your family. The deeper you peel into a cabbage, the thicker and smaller the leaves become. They are easier to peel back when your cabbage has been sitting in room temperature for a couple of hours or by soaking the cabbage in water for about an hour. When your ready to peel them off, simply stem the bottom off to break them apart. The first few leaves you peel off are usually very thin and can tear easily so I suggest not using those. Keep in mind, slamming the cabbage can cause some breakage and blanching can cause the leaves to become too soft and will destroy raw nutrients. For the fajita filling, cut zucchini, bell peppers, and onions longwise about 2 inches in length. Spray a pan with olive oil and stir fry ingredients for about 5 minutes until they are softened. Add in the garlic, onion powder, liquid aminos, and 1/2 of the lime juice to simmer for another 2 minutes. Remove from heat and cover. We used homemade pinto beans for this recipe. Pinto beans were smashed so they could be spread into the cabbage leaves. You can season your beans to your preference but we spiced up ours with only garlic powder and pink salt to keep it simple. The quinoa was only seasoned with garlic and salt too. Feel free to use any spices you prefer. You can even go with using beans and brown rice instead of quinoa if that’s what you have. For the tomato topping, toss together chopped tomatoes, green onions, minced red onion, cilantro, and the remaining lime juice with a dash of salt. Mix and set aside. Keep it raw and go with sliced avocados instead of sour cream! They add creaminess without the dirty dairy and a dose of healthy fats to keep you satisfied. They give your tacos a nice contrasting texture to go along with the crunch of the cabbage. If you prefer, you can make a spicy guacamole instead with the avocado by mashing it with lime juice, minced jalapeno and salt to go with your fajitas. Heat oil and saute the white onions, garlic, oregano and seitan to a lightly caramelized state. Stir in the white hominy and the red chili sauce along with a few cans of water. You want to judge the amount of water to add depending on how thick or thin you prefer your soup. Bring to a boil for a good 5-10 minutes then remove from heat. Feel free to add any other vegetables you like. Serve immediately with the pozole garnish and some extra squeezes of lime… Hope you enjoy it as much as we did!